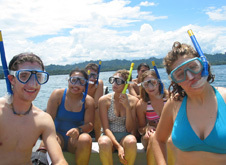 This summer program offers students the opportunity to gain hands-on experience in tropical studies in Costa Rica, a renowed leader in the field of environmental conservation. Students participate in two weeks of online coursework at home, and three weeks of field work and lectures on-site. The online portion of the program will allow students to interact with their professor and classmates, participate in discussion forums, and write blog entries through a virtual platform for internet-based courses. Once on-site, students will meet their professor and classmates and together continuetheir program, which includes in-person lessons at Veritas University and field sessions at national parks, protected areas or even indigenous reserves. All classes are taught in English.